Pureform Furniture are an Adelaide based design studio with qualifications, skills and experience from a range of design disciplines including interior architecture and furniture design. 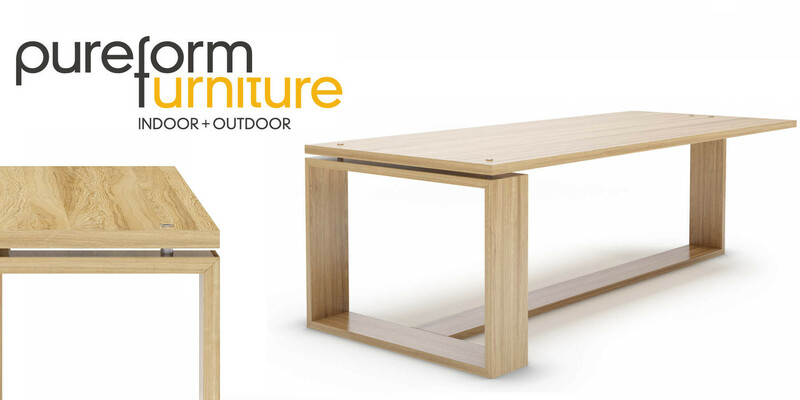 Pureform design and build in Adelaide their custom designed Australian furniture with one off or small batch pieces. Pureform rely on the Rendersmart team to produce accurate and realistic production visualisation. Studio photography costs are extremely high and lack significant flexibility in both shooting a product and also the pure logistics. If any product is not shot on the day, a new shoot needs to be organised and all those costs are rinsed and repeated. It is becoming more and more popular to shoot products virtually in 3D than in reality due to the high consistency of quality, style and ability to alter colours and finishes. If you need a new product visualisation, there is no need to setup another shoot as the template is ready and the new product simply needs to be prepared, rendered and special effects added in Photoshop to tidy things up just like any photo shoot. Whilst the costs of a good product visualisation is also an investment it must be known that the same attention to detail that a photographer undertakes with lighting his or her subject needs to be achieved with tedious tweaking of lights, cameras, and virtual reflectors. Some solutions are simpler than others and it depends on our client’s needs. Our approach with Pureform was a completely customised solution to meet the strict demands laid out for lighting and shade which was achieved using new techniques only achievable in 3D where one sets of lights were used to illuminate the object, and another set used to tweak and adjust the shadows without affecting the overall illumination. Whilst this does defy physics in the real world, the outcome was exactly what the client wanted to achieve.